Growing up, I read a few Zane Grey books. In later years, I became quiet fond of the works of Peter Brandvold, Ralph Cotton and Robert J. Conley. I probably do half of it on the web. I also have a lot of books about the Old West. The series is called “Loner with a Badge.” Jake Stone is foremost an investigator. Of course, the benefits from his job often come in the form of bounties. Some people often refer to him as a bounty hunter, but a lot of his work entail things other than looking for wanted outlaws. He’s good enough in his work that he is often called upon by the U.S. Marshal’s office. He holds the position of Special Deputy, which presents him with a badge. Most of his work is done alone, hence the Loner with a Badge. I would say that was about equal. You have to have good villains to have good stories. They can also lend to a little humor on occasion. It all depends. Most of the villains are not likeable characters. On the other hand, you can often have a villain people like and often relate to. What real-life inspirations did you draw from for your book? Are any of your characters people you know? Yes. When I was a child, a neighbor boy threw a tin can and severely cut the top of my head. I still have a scar. I put him in my first book and killed him in the second chapter. I think there is a resurgence. That could well be because some of the people who loved Westerns as a child are now retiring and find more time to read. It also seems some of the younger people have started to read Westerns. Discovering how hard it is to write a book. One has no idea how hard it is until they have done it. Yes, I can. In fact, I would like to venture in that direction. In most all of my books I have done research and learned things I didn’t know before. Not really. I strive to make the stories as exciting and as fast-paced as possible and just want the reader to enjoy what he or she is reading. At this moment, I am working to make a full-length novel with a short story titled “Badman and the Banshee. Like most authors, I wasn’t always an author. If I could just ask and receive, I probably would like to have been an actor. I am very accessible on Facebook and you can also contract me via my publicity office Nick@nickwale.org. I love to hear from readers. The stage on which bounty hunter Stone is traveling suffers a busted wheel coming off the peaks of the Sangre de Cristo Mountains. A blizzard is imminent. There is a railway only a few miles away. Attempting to expedite their rescue, Stone strikes out in search of the railroad. Not only does he find the railroad, but he finds a train. Unfortunately, this train has been robbed and all but one of the crew is dead. Taking a quick lesson on engineering from a wounded brakeman, with the tracks up ahead destroyed, Stone fights to move the train—backward. The trick seems to work until snowdrifts and deadfall cause the train to derail. Stranded miles from anywhere Stone discovers that the outlaws did not find what they wanted when they robbed the train… they will be back. Will Stone manage to subdue the gang—or will they be the criminals who finally retire him? 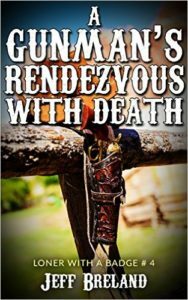 Download your copy of “A Gunman’s Rendezvous with Death” today from Amazon. 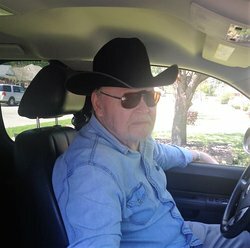 You won’t want to miss the latest bonanza from Breland!